I feel like I must be the only person who’s still wrapping Christmas gifts! Moving into a new house, that is still under going renovations, a few weeks ago has thrown me so far behind this year. It took me a while to figure out how to decorate this year’s tree, but in the end I decided to go with a rustic vibe. But most of the wrapping paper that I already have is bright and colorful. I needed something more subdued and rustic to go with my tree. It also needed to be quick and easy, because did I mention – I’m running so far behind??? To keep the wrapping fast, uncomplicated and inexpensive, I kept the number of supplies to a minimum. I only used a couple of different papers and embellishments on all of the gifts. If you aren’t able to locate brown bulletin board paper, you can always use regular brown craft paper. I much prefer the bulletin paper though, because it’s thinner and so much easier to work with. Plus it’s 48″ wide as opposed to the typical 30″ width of craft paper. 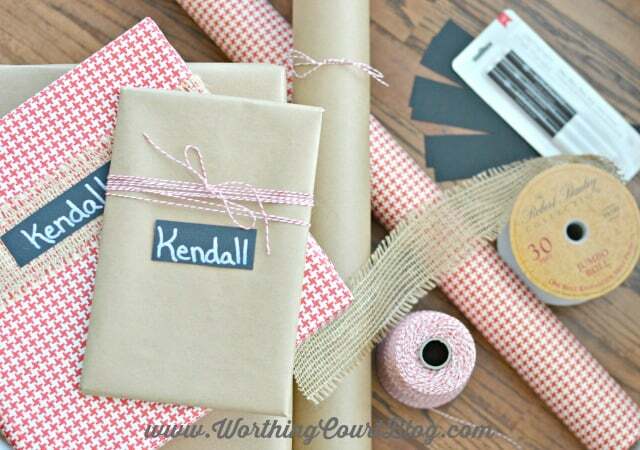 All it takes to wrap the brown paper package is a length of burlap ribbon that is long enough to completely wrap around the wrapped gift, a strip of the black cardstock with the recipients name already written on it with a chalk marker and enough baker’s twine to wrap completely around the gift several times plus some extra for tying a small bow. 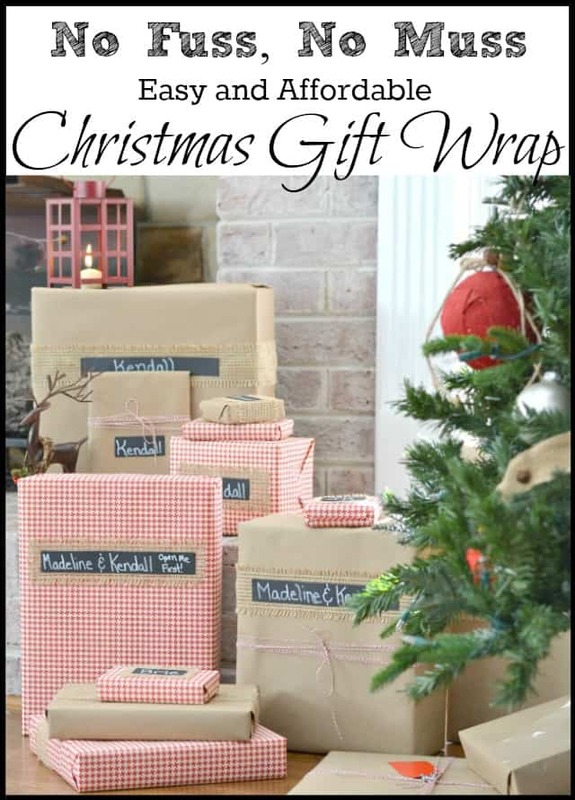 Wrap the burlap around around the gift and secure it on the back side with hot glue. Once the glue has dried, flip the gift over to the front side and hot glue the name tag to the ribbon. Wrap baker’s twine around the gift several times and tie it into a small bow. 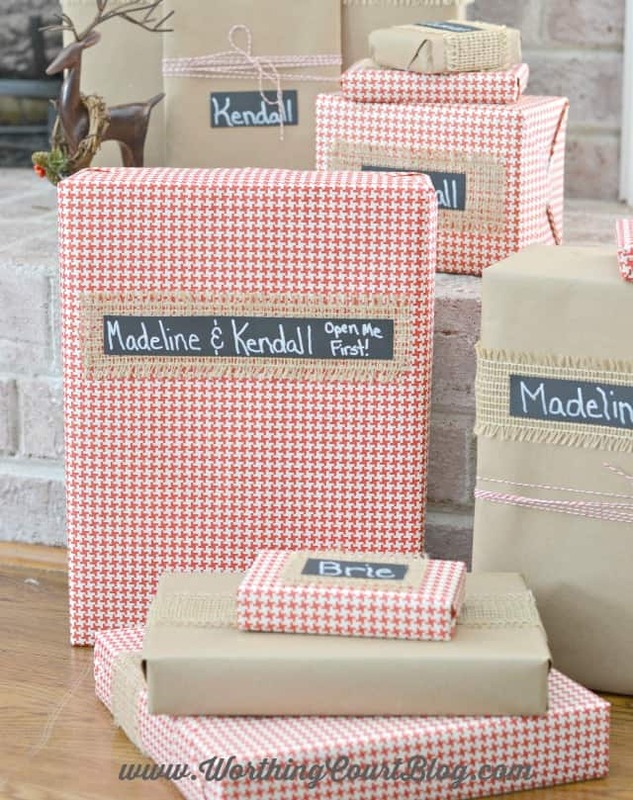 The gifts wrapped with the red houndstooth paper were wrapped in a similar way. The only difference is that I didn’t wrap the burlap ribbon completely around the gift and I didn’t use any baker’s twine with the red paper. To change things up a bit, I only used a piece of burlap ribbon long enough to reach most of the way across the front of the gift. Both the ribbon and name tag were applied with hot glue. In the past, my gift wrapping seemed to take forever and often felt like such a chore. But this was so quick and easy and totally enjoyable! Just a few more gifts to wrap and I’ll be ready! How about you? Thank you so much, Jane! I love that hat too. I got the bulletin board paper at a local paper supply store called, ‘If It’s Paper” (I’m in Greensboro, NC)”. I think it cost $1.50’ish per foot and I bought 10 feet of it. If you aren’t able to find it in your area, I know you can find it online by doing a search under “bulletin board paper”. Glad to know I’m not the only one not quite finished yet! Merry Christmas! What great ideas! Your tree is so lovely, too. And no, you are most definitely NOT the only person still wrapping gifts. I’m still shopping, even! I feel your pain, Ellen! I may be behind on everything else, but I had a self-imposed deadline when it came to shopping this year. Normally, I much prefer hitting the stores when it comes to shopping because I’m a touchy-feely kind of person. Plus I enjoy the Christmas hustle and bustle. But this year I had no choice but to do most of my shopping online. Our family get together is TODAY, so I had to get everything here and wrapped on time. Oy. Merry Christmas to you and your loved ones! 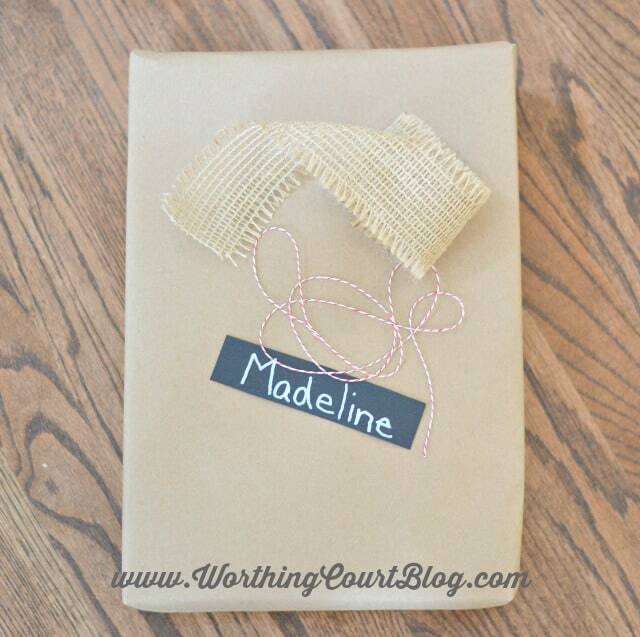 Love your gift wrap! 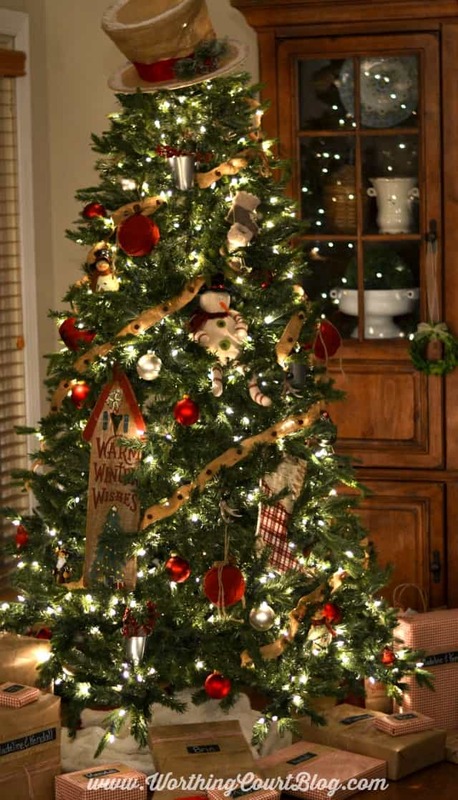 It looks so great with your tree decorations!! I’m so far behind shopping this year from making doggie outfits. I haven’t wrapped one thing yet…. ugh. In fact I’m going out to fight the crowds today (you’d think being retired I’d have the sense to shop on weekdays). Y’all have fun today! Merry Christmas!! Merry Christmas to you, Nancy! We simply MUST carve out some time together after the holidays. I miss seeing you! 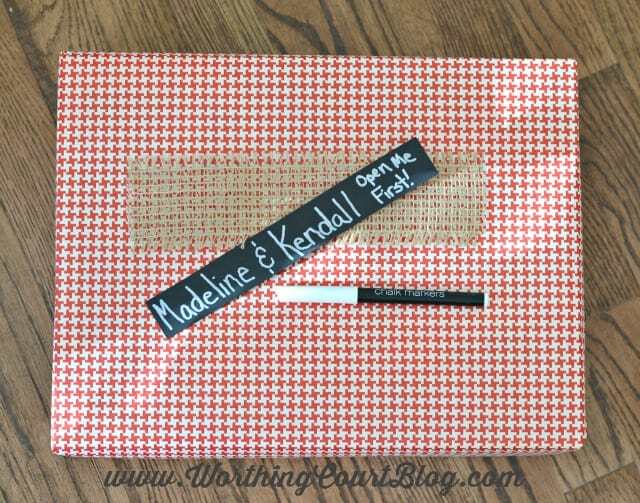 Love your wrapping ideals and that you added where to find the supplies! Thank-you! 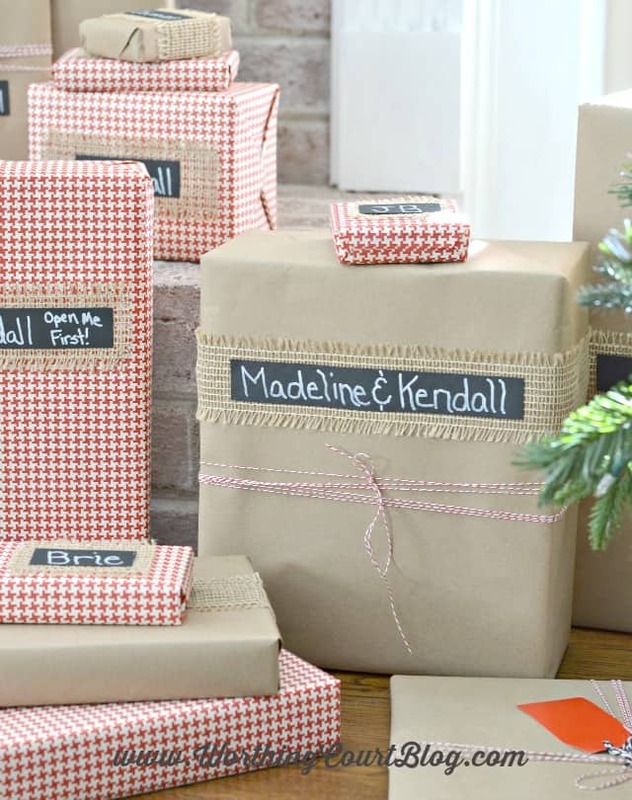 Thank you so much for sharing your wonderful gift wrap ideas! They look amazing! 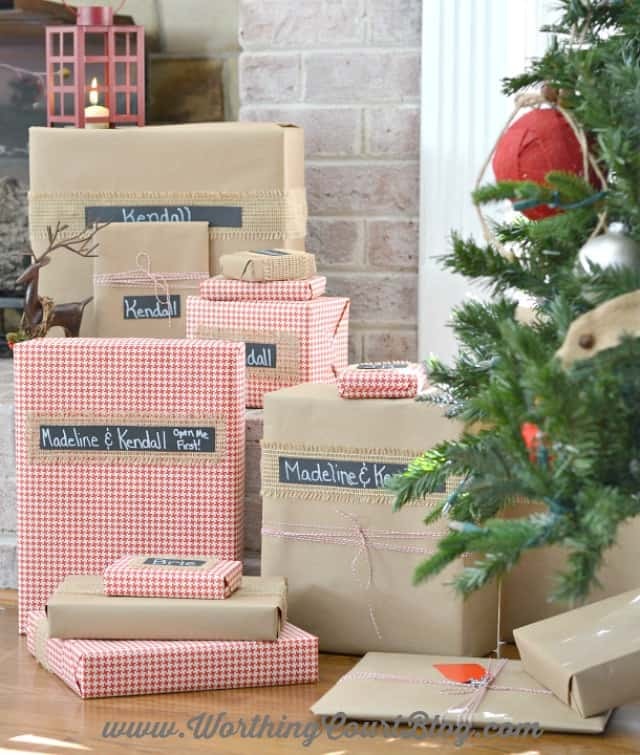 I used lots of regular brown craft paper in the past for wrapping presents but I will definitely try your idea with the bulletin board paper. Thanks for the idea! Beautiful tree!! And I love your wrapping ideas. Thank you for sharing! !